Today’s column looks at three wildly unrelated topics and finds the key point they all share. I live in Vancouver, the 2010 Olympic host city although, I confess, sports don’t mean much to me. Still, when hockey player Wayne Gretzky lit the cauldron last Friday night, even I felt a little whoosh of pride. I’m not attending any events though. That’s because we’re massively distracted with rebuilding our house — a project that will end, mid-Olympics, Feb. 24. 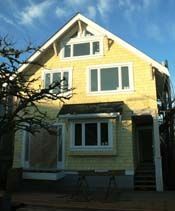 A few years ago, we decided to do a little work on our charming but woefully inadequate 1913 heritage home. Lovely though it was, we had only one bathroom (for a family with three teenagers!) My office, perched in the non-insulated roof, was too hot in summer and too cold in winter. And we had no storage. None! I had plastic boxes under the bed for many of my clothes. When we bought the house, in 1991, it was checked over by an inspector and my brother-in-law who’s a structural engineer. Both gave it a relatively clean bill of health. Fast forward almost two decades and we planned a minor renovation. Again we called my B-I-L for a quick check. This time, however, he expressed doubts. “How long do you plan to live here?” he asked. His concern was structural — the east wall was bowing out. Our hearts sank because this meant either (a) hugely expensive repairs or (b) selling at lot value. Worse, this bad news hit just when real estate prices in Vancouver were zooming uphill as fast as athletes on a turbo-charged ski-lift. After we went to a couple of open houses, my heart sank even deeper in my non-skiing boots. We could never afford to stay in our much-loved neighborhood. Then, suddenly, I remembered an obscure real estate factoid. Our property, which had a vast side yard, was labelled a 49.5 ft lot. But, legally it was a 33 ft. lot adjoined to a 16.5 ft one. Better yet, our neighbours had the same configuration. “Hey,” I said to my husband. “All we have to do is persuade our neighbours and we can sell our 16.5 ft. lots together!” That magic combo would give us enough money for a major renovation. We laughed at my crazy idea, but, unbelievably, it worked. Our properties sold at the top of the market in 2007 and two new houses started going up next door. Then we began negotiating with the city over our own building plans. I’ll spare you the gory details, but rest assured it wasn’t pretty. It took more than a year. Building, which started last March, wasn’t easy either. We had to find another house to rent throughout the project. We had a wrangle with the architect over a host of tiresome details. And we had to pick up our house and move it two feet east and one foot south. In short, we had a bellyful of difficulties. But guess what? It’s almost done now and it looks great. When we’re writing, many things can go wrong. We can’t figure out what we want to say. Sources refuse to be interviewed or are deathly dull. We have difficulty allowing the time to write. We can’t find the right paragraph, the telling sentence or the perfect word. And when we try to edit, we’re hopelessly close to the work. But the route to success is simple. Don’t think about the size of the project. Instead, figure out the infinitesimally small step(s) you need to accomplish each day. It may take you longer than a year — as it took my family with our house (pictured above.) It may take many years, as it does for Olympic athletes. But put your head down and deal with the little piece of work in front of you right now. Think only about what you need to do that day. And then, here’s the hard part. Do it.